Kathmandu, 5 February: Nepal’s trade treaty with India is in need of substantial revisions in order for Nepal to be able to arrest its ballooning trade deficit with its biggest trade partner. Trade experts, industrialists and former policymakers expressed this view today at an interaction programme on Nepal-India Trade Treaty: Opportunities and Challenges, jointly organised by Ministry of Industry, Commerce and Supplies and South Asia Watch on Trade, Economics and Environment (SAWTEE). This programme was organised to gather inputs from stakeholders at a time when the Government of Nepal is in the process of negotiating a review of the trade treaty with the Indian government. Making his presentation on Nepal-India Trade Treaty: Some Avenues for Review, Dr Posh Raj Pandey, Chairman, SAWTEE, said that in view of facts such as a burgeoning trade deficit, failure to participate in value chains, the presence of non-tariff barriers, preference erosion, the adverse impact of the treaty on producers of primary agricultural goods, inadequate trade facilitation measures and lack of or slow targeted support for building trade capacities, there are many issues that need to be discussed and revised in the treaty. He further stressed the fact that though India has successfully been able to include goods of their interest, Nepal has failed to do so. Some of the revisions to the treaty he suggested included: exempting Nepal from the requirement to provide duty-free access to primary agriculture products from India by revising the provision for reciprocal duty free market access for such products in the Protocol with reference to Article IV; simplifying the rules origin that Nepali manufactured goods have to fulfil to gain duty-free access to the Indian market to an option between a 20 percent value addition and a change in tariff heading; revising a provision in the current treaty that requires Nepal to extend to India any preferential treatment it accords to any product exported by any other country so that Nepal can effectively and freely enter into trade agreements with other trade partners; and given the non-tariff measures and barriers that are constraining Nepal’s exports to India, making binding and operationalizing a provision in the current treaty under which India has pledged to assist Nepal in building its standards-related capacity. He further added that the government needs to put forward the proposal to remove the provision of tariff rate quotas on vegetable fats, acrylic yarn, copper and zinc oxide, waive Integrated Goods and Services Tax (IGST) for the products produced by small units, allow Nepal to import third country goods from India for specific purposes, and also remove the time-bound nature of the trade treaty to ensure greater certainty. Senior Vice President of FNCCI, Mr Shekhar Golchha said that Nepal has not been able to promote its exports as the cost of doing business is very high and the business environment was also plagued by political instability and energy crisis, among others, but now that these issues have been resolved to a certain extent, the focus now needs to be on developing infrastructure at the border to promote exports. He echoed the suggestion that the rules of origin be simplified to a single, less onerous rule such as a change in tariff heading; the differences in standards and technical regulations between the two countries be addressed to facilitate Nepali exports; Nepalese be allowed to import third-country goods, including raw materials, from India as in many instances doing so would lower the cost of production; and the existing provision for the conditional rebate of excise duty be adapted to ensure similar rebate on IGST. Mr Kamalesh Agrawal, Secretary General of Nepal Chamber of Commerce, urged the government to negotiate an exemption of IGST for small and medium-sized firms, which would help boost their exports. Former Secretary Mr Purushottam Ojha said that some of the favourable provisions of the treaty—such as a partial rebate of excise duty on exports by Nepali medium and large firms that can prove that their cost of production is higher than that of their counterpart firms in India; a pledge by India to help Nepal build its capacity concerning standards and testing; local-level committee comprising local stakeholders in border areas to address trade frictions—remain unimplemented. He urged the government to work out ways to have such provisions implemented. Participants stressed the fact that the treaty needs to be reviewed before renewing. They further added that Nepal needs to build its strength and capacity in order to promote its exports. 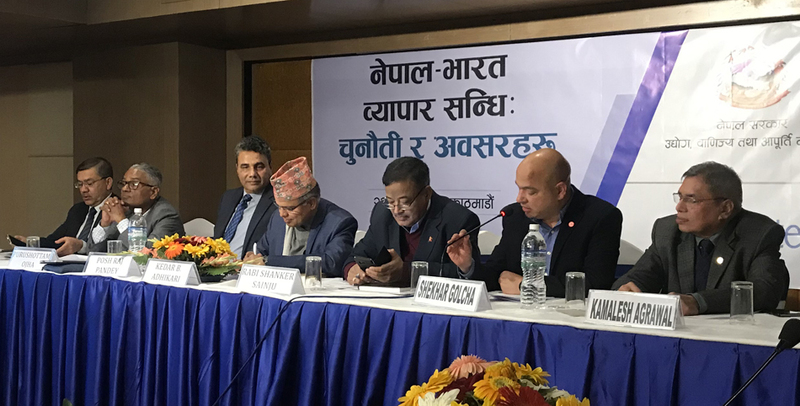 Speaking as the chair, Mr Kedar Bahadur Adhikari, Secretary, Ministry of Industry, Commerce and Supplies, said that the government would do its best to incorporate the suggestions forward by the stakeholders, adding that consultations with stakeholders are an ongoing process.